Having read the exploits of the highly secretive Navy SEAL Team 6 (who do not exist officially, and yet everyone has heard about them – how ironic is that? ), you might want to go on a little spying adventure of your own, and you would need state of the art devices apart from stealthy gizmos and gear to aid your cause. 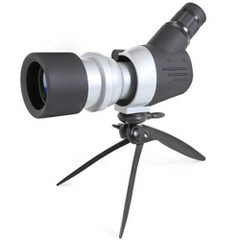 How about the Packable Spotting Scope? The name of the scope itself is self explanatory, where it retracts to only 8″ long, tipping the scales at less than 2 lbs. for easier portability. The retracted scope will be 50% smaller compared to traditional models. The 52mm objective lens has been fully coated so that it delivers better light transmission and visual clarity in limited or abundant ambient light, while its lens adjusts from 15X to 45X magnification and focuses on objects without blurring. The asking price? A rather pocket friendly $129.95, so there shouldn’t be any objections there from the missus.